Compatible for both Apple Watch Series 1 and Series 2, 38mm Version Model. Personalized your apple watch with this refined replacement premium stainless steel wrist band. 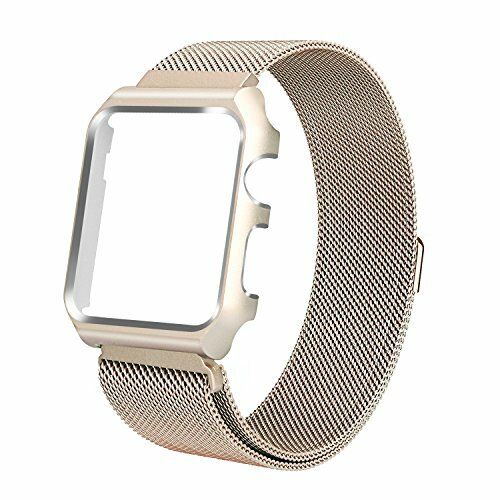 Mesh band with metal protective case design makes your apple watch a totally new classic and pleasant look. - Designed specially for Apple Watch, compatible with 38mm Apple Watch. - Advanced front cover Snap-On design for easy installation. - Brushing a layer of white rubber oil instead of the black sponge in side the watch case not only protects your precious watch from being scratched, but also makes it more beautiful. - Extreme Light makes it much more comfortable to wear. - With the very strong magnetic closure clasp, easy and convenient to adjust the length that fits your wrist, providing you the best wearing experience. - Elegant and fashionable appearance, best gift for yourself , your family or friends! We do not recommend you to use this Milanese band with daily desk work or frequently rub with the desk surface. But please kindly understand that our team is trying to make it better. 2. The magnet of the clasp is very strong, no problem with most sports. If our band does not work well for you, please kindly contact us for your warranty replacement. There are the Steps to Contact Seller: Sign in your Amazon account - Choose "Your Orders" - Find that order - Click "Contact seller" on the right side. Thank you again for your choosing ALNBO, hope the product can bring you an excellent experience! If you have any questions about this product by ALNBO, contact us by completing and submitting the form below. If you are looking for a specif part number, please include it with your message.